"This is a rich, creamy, Italian-style Alfredo sauce perfect for chicken and seafood pastas! I discovered this recipe after relentless searching for an authentic Alfredo sauce that doesn't use cream cheese." Melt the butter in a large pot over medium heat. Stir in the garlic and flour, and cook and stir until the garlic is fragrant but not browned, about 1 minute. Whisk in heavy cream and milk, whisking constantly until the mixture is hot and slightly thickened, about 10 minutes. Gradually stir in the Parmesan cheese and fontina cheese. Season with salt and black pepper. Continue to simmer until the cheese has melted and the sauce is thickened, stirring often, 20 to 30 more minutes. 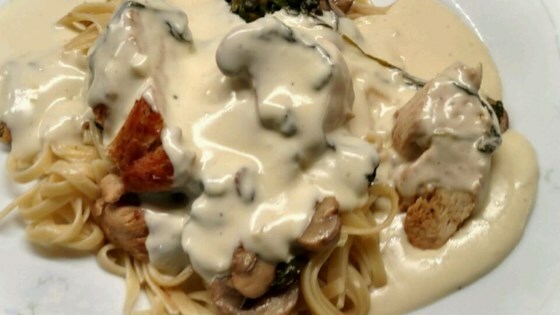 A rich and classic Italian creamy sauce! Do not let the sauce boil at any point or it will separate and become grainy! Thank you so much for this recipe! It was the best I've ever had and I've been married to a chef for 21 years! This is absolutely excellent!!!! It is very rich and high in fat so it is only a special occasion recipe. I've made many an alfredo sauce in my lifetime and this is the VERY BEST! OUTSTANDING! The key is cooking it slowly and baby it a little. It takes time but it is so worth it!